Over the last few years Dave Clarke’s musical output has been on the increase, in particular since teaming up with Mr Jones as Unsubscribe, and now he’s collected up some of his favourite remixes. Each of the entries on Charcoal Eyes was recorded in his new studio in Amsterdam and is given a backstory in the sleeve notes alongside a two verse poem by Clarke suggesting strong personal ties to this work. The mix of acts such as I Am Kloot, Placebo, Amazing Snakeheads and The Soft Moon are bands rather than electronic music artists - a nod to his own punk-loving side - to which Clarke brings his electro and techno stylings in his anarchic way of challenging the listener rather than conforming to the ‘just a little bit different’ approach for mainstream remixes. The punk vocal delivery is often heard in Clarke’s sets. He tends to prefer shouty or dramatic voices in his music matched up to thunderous techno beats or de-constructed electro rhythms, so here we find Clarke taking those vocals and giving them the electronic support he feels they deserve. Clarke’s take on Placebo’s “Scene of the Crime” is a case in point as the heartfelt vocals are supplemented by a winding pulse that cradles Brian Molko’s tortured delivery. 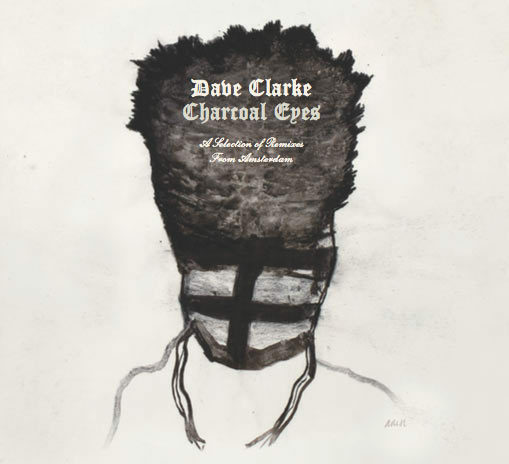 Through Clarke’s charcoal eyes, the world is a joyously dark place. Maelstrom and Louisahhh! collaboration “Rough & Tender” is given the ‘gothic stripped down’ treatment meaning Louisahhh! electro-friendly, emotionless statements stand tall above percussive stabs and a sinister synth while a ‘gothic’ styling of The Neon Judgement’s “TV Treated” is similarly twisted and darkness envolps The Soft Moon’s “Wrong” with industrial-strength menace that verges on dubstep inspired sub bass. The full blown techno storms in via Amazing Snakeheads “Here Comes Again” which sets the pace fast then shuffles in ghostly synths and the Digital 21 + Stefan Olsdal “Rebellion” which is an off-beat slow build into a dirty finale. Charcoal black these remixes certainly are, smeared with an underworldy quality and perhaps a beckoning to join Clarke in the darkness with his version of A Place to Drive Strangers’ “Straight” with its scattering drums. CD and digital versions include Clarke providing a nod to pioneer Gary Numan for John Foxx’s “Underpass” - a retro beauty - and riding the guitars of “Here it Comes Again” for a distorted rework before teaming up with Mr Jones for Unsubscribe remixes of Crash Course in Science’s “Flying Turns” and House of Black Lanterns’ “Broken” which maintain the eerie nature of the solo pieces. While we may never see another Clarke artist album, his persona is very clearly present on all of these remixes where the precision and quality of sound and construction have all his hallmarks. Through his charcoal eyes, the world is a joyously dark place.